Access and use of this web site are subject to your compliance with the terms and conditions set forth below. If you do not accept all the terms and conditions stated here, do not use this web site. Any legal claims or law suits in connection with this web site or its use are subject to the laws of the Federal Republic of Germany excluding CISG. The legal venue will be in Nürnberg/Fürth if the user is a merchant in the sense of the German trade law. If you access the web site from outside Germany, please note that your local laws may restrict your rights to access the web site. If you access the web site from outside Germany, you do so at your own risk and are responsible for compliance with the laws of your jurisdiction. All texts, documents and illustrations published on this web site are provided for your personal information. No user of this web site may resell, republish, print, download, copy or make accessible any portion of this web site or the contents for commercial or noncommercial use without the prior consent of the publisher. Only contents which were provided specifically for this purpose, particularly press releases are exempt from these rules. All trademarks and service marks are property of their owners. 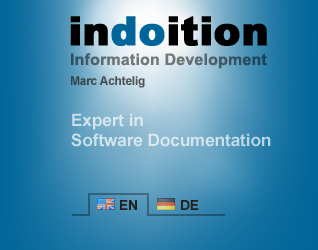 indoition® is a registered trademark and service mark of Marc Achtelig. The texts and databases of this web site may contain trademarks copyrighted by third parties. Non-authorised use or misuse or modification of these trademarks or other materials is prohibited and is a violation of proprietary rights. The web site contains links to third party web sites. Theses links are provided solely as a convenience to you and not as an endorsement by the publisher of the contents on such third-party web sites. The publisher has no influence on the design and content of the linked web sites. When the link was set up, as well as when it was checked at regular intervals, the publisher could not find any illegal content on any of the linked web sites. However, the publisher expressly declares that the linked web sites do not reflect his opinions and that he does not endorse what is published on these web sites. If you decide to access linked third-party web sites, you do so at your own risk. In no event shall indoition Technical Communication Services Marc Achtelig be liable for the availability or the contents of such web sites nor for any damage arising, directly or indirectly, from any use of the information contained on such web sites. Links to other web sites are provided solely for the convenience of the users of this web site. Access to any of the third-party web sites listed as hyperlinks is done at the user’s own risk. Unless expressly stated otherwise, indoition Technical Communication Services Marc Achtelig does not cooperate with the publishers of linked web sites. The information contained on this web site was compiled from internal and external sources with professional care and is provided in good faith. Every attempt is taken by the editor to ensure that it is accurate, up to date and as comprehensive as possible. However, the publisher gives no explicit or implicit warranty as to the reliability, accuracy or completeness of the information contained on this web site. The web site and all scripts were tested on a number of different systems and browsers. However, no guarantee can be made that the web site runs on any configuration. Therefore the publisher strongly recommends that you back up all data before you access the web site. The publisher shall not be liable for any loss of data or other damage, unless the publisher acted deliberately or failed to act when he knew of an immediate danger. All files of the web site are checked for viruses at regular intervals. However, no guarantee can be made that they are absolutely free of viruses at all times. Files on third-party web sites that are linked with the web site are not checked for viruses. It is strongly recommended that you check all downloaded files for possible infection before you open them for the first time. The publisher shall not be liable for any damage that might be caused by the infection with viruses, unless the publisher acted deliberately or failed to act when he knew of an immediate danger. YOU EXRESSLY UNDERSTAND AND AGREE THAT THE USE OF ANY SERVICES OFFERED BY THE WEB SITE IS AT YOUR SOLE RISK. THE WEB SITE IS PROVIDED ON AN “AS IS” AND “AS AVAILABLE” BASIS. THE PUBLISHER EXPRESSLY DISCLAIMS ALL WARRANTIES OF ANY KIND, EXPRESS OR IMPLIED, INCLUDING WITHOUT LIMITATION ANY WARRANTY OF MERCHANTABILITY, FITNESS FOR A PARTICULAR PURPOSE OR NON-INFRINGEMENT. THE PUBLISHER MAKES NO WARRANTY THAT THE WEB SITE WILL MEET YOUR REQUIREMENTS, OR THAT THE WEB SITE WILL BE UNINTERRUPTED, TIMELY, SECURE OR ERROR-FREE, NOR DOES THE PUBLISHER MAKE ANY WARRANTY AS TO THE RESULTS THAT MAY BE OBTAINED FROM THE WEB SITE OR AS TO THE ACCURACY OR RELIABILITY OF ANY INFORMATION OBTAINED THROUGH THE WEB SITE. THE PUBLISHER SHALL NOT BE LIABLE FOR ANY DIRECT, INDIRECT, INCIDENTAL, SPECIAL OR CONSEQUENTIAL DAMAGES ARISING OUT OF OR RELATING TO THIS AGREEMENT, THE WEB SITE, THE MATERIALS OR THE POSTINGS, OR RESULTING FROM THE USE OR THE INABLITY TO USE THE WEB SITE, INCLUDING BUT NOT LIMITED TO, DAMAGES FOR LOSS OF PROFITS, USE, DATA OR OTHER INTANGIBLES. THESE LIMITATIONS DO NOT APPLY IF THE PUBLISHER ACTED DELIBERATELY OR FAILED TO ACT WHEN HE KNEW OF AN IMMEDIATE DANGER. The publisher reserves the right to delete or change parts of the web site or the complete web site without notice, and to terminate publication temporarily or permanently. All Information regarding legal issues express personal experiences and opinions and are not intended to replace the advice of a lawyer. All offers are made without obligations. Except as expressly provided in a particular legal notice posted on the web site, these terms of service constitute the entire agreement between you and the publisher with respect to the use of the web site. The publisher’s failure to insist upon or enforce strict performance of any provision of these terms of service shall not be constructed as a waiver of any provision or right. The publisher may assign his rights and duties under these terms of service to any party at any time without notice to you. If any provision of this agreement is found invalid by any court having competent jurisdiction, the invalidity of such provision shall not affect the validity of the remaining provisions of this agreement, which shall remain in full force and effect.